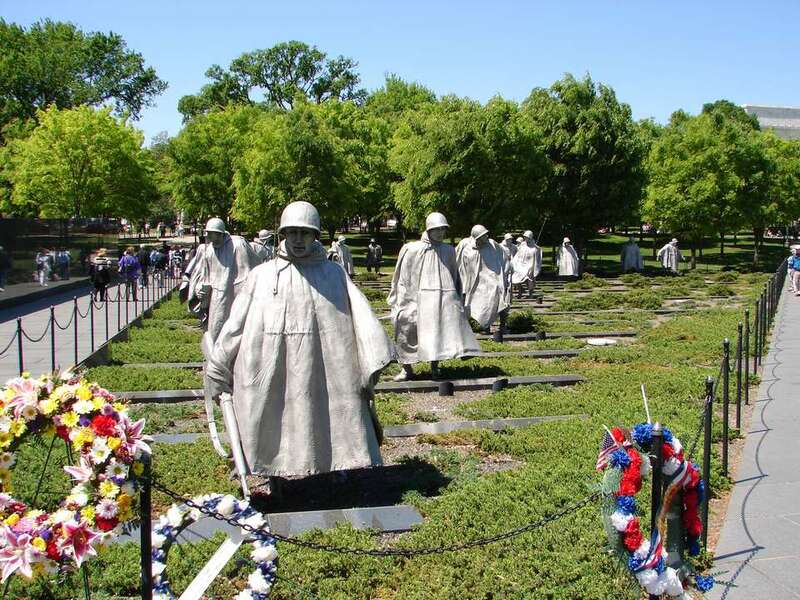 The Korean War Veterans Memorial in Washington, DC was dedicated in 1995 to 1.5 million American men and women who served in the Korean War from 1950-1953. The expansive memorial includes a group of 19 statues that depict soldiers on patrol facing an American flag. A granite wall has a mural of the faces of 2,400 unnamed soldiers with a reading that states “Freedom is not free.” A Pool of Remembrance honors all soldiers who were killed, wounded or missing in action. The Memorial Foundation is currently promoting legislation to add a Wall of Remembrance to the Memorial, listing the names of the veterans. The memorial is located on the National Mall at Daniel French Dr. and Independence Ave., NW Washington, DC. See a Map The nearest Metro station is Foggy Bottom. Limited parking is available near the National Mall. The best way to get around the city is to use public transportation. For suggestions of places to park, see a guide to parking near the National Mall. Memorial Hours: Open 24 hours. The memorial features 19 larger-than-life-sized statues, designed by Frank Gaylord, dressed in full combat gear. They represent members of all of the branches of the armed-forces: the U.S. Army, Marine Corps, Navy and Air Force. The black granite mural wall, designed by Louis Nelson of New York, consists of 41 panels extending 164 feet. The mural depicts Army, Navy, Marine Corps, Air Force and Coast Guard personnel and their equipment. When viewed from a distance, the etchings create the appearance of the mountain ranges of Korea. The Memorial has a reflective pool that encircles the mural wall. The pool is intended is to encourage visitors to view the Memorial and reflect on the human cost of war. Inscriptions on granite blocks at the east end of the monument list the numbers of soldiers who were killed, wounded, held as prisoners of war and missing in action. Unfortunately, most visitors don't see the casualty figures as they are not prominently in view. Visit on a nice day so you can enjoy walking around and reading the inscriptions. Be sure to take some time to walk around and check out some of the other Memorials in the area.